The Alzheimer Disease Metabolomics Consortium (ADMC) is a bold initiative that brings together leaders in Alzheimer’s disease (AD) clinical and basic research to work in close collaboration with centers of excellence in metabolomics, genetics, biochemistry, engineering, and bioinformatics. We aim to define metabolic failures across the trajectory of disease connecting peripheral and central changes. We define alterations in biochemical pathways and networks that can help us gain deeper understanding of disease mechanisms and that can highlight novel targets for drug design. We are a part of the National Institute on Aging’s (NIA) funded national initiatives that includes Accelerated Medicine Partnership for Alzheimer Disease (AMP-AD) and Molecular Mechanisms of Vascular Etiology of Alzheimer Disease (M2OVE-AD). Connecting metabolomics data to genomics, imaging and other rich omics data in a systems biochemical approach we seek to sub-stratify AD stepping towards a precision medicine approach for disease classification and management. The end results of metabolic profiling of large AD cohorts and community studies is leading the way to the creation of a national database for AD and an Atlas that can enable the AD community with a road map for novel drug discovery. All data generated by the consortium is made publicly available. As shown in figure below we are partners with other consortia embedded within AMP-AD and M2OVE-AD where different types of large data are being used to inform one another creating an unparalleled opportunity to generate new hypothesis about disease mechanisms. 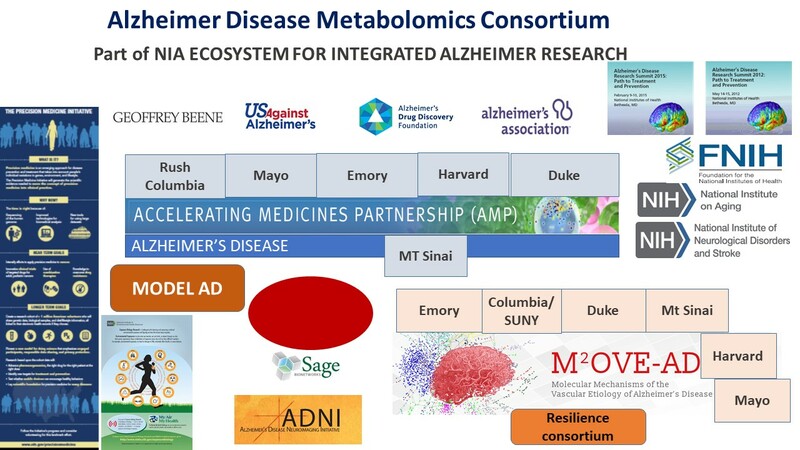 Alzheimer's Disease Metabolomics Consortium is powered by WordPress at Duke WordPress Sites. Please read the Duke Wordpress Policies. Contact the Duke WordPress team.